WASHINGTON (CNS) — Pope Francis has named Bishop Edward J. Burns of Juneau, Alaska, to be bishop of Dallas, succeeding now-Cardinal Kevin J. Farrell, who headed the Dallas Diocese until he was named in August to be the first prefect of the new Vatican office for laity, family and life. 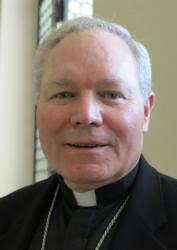 Bishop Burns, 59, has headed the Diocese of Juneau since 2009. A priest of the Diocese of Pittsburgh, he is a former rector of St. Paul’s Seminary in Pittsburgh and former director of the U.S. bishops’ national offices dealing with clergy, vocations and priestly formation. The appointment was announced Dec. 13 in Washington by Archbishop Christophe Pierre, apostolic nuncio to the United States. Bishop Burns will be installed as the eighth bishop of Dallas Feb. 9. “I am profoundly grateful for my experience in southeast Alaska and I pray for God’s grace as I take on my new duties as chief shepherd of the Diocese of Dallas,” Bishop Burns said. Bishop Burns is the current chairman of the U.S. Conference of Catholic Bishops’ Committee on the Protection of Children and Young People. He also is a member of the bishops’ Subcommittee on Catholic Home Missions and has been a member of their Administrative Committee. He was named bishop of Juneau by Pope Benedict XVI Jan. 19, 2009, and ordained a bishop March 3, 2009, at St. Paul Cathedral in Pittsburgh, his home diocese. His installation was April 2, 2009. The 37,600-square-mile Diocese of Juneau is considered one of the U.S. church’s home mission dioceses. Out of a total population of 75,000, it has 10,000 Catholics. In a recent interview with Catholic News Service in Juneau, Bishop Burns said that when he became diocesan bishop there, he learned that 10 percent of its population was Catholic and 60 percent didn’t identify with any religion. “I thought to myself, ‘What a wonderful challenge this is going to be,'” he said. “It’s an opportunity for us to engage in the new evangelization, because it’s not like these people have never heard of Jesus Christ, or the Gospel message, or that they’ve never been in contact with the church. It’s just that they choose to be secularists. They have chosen to step aside from their religion or faith. The son of Geraldine Little Burns and the late Donald P. Burns, Edward J. Burns was born Oct. 7, 1957, and raised in the Pittsburgh area. After high school, he attended St. Paul Seminary/Duquesne University in Pittsburgh, where he earned a bachelor of arts degree in philosophy and sociology. He then attended Mount St. Mary’s Seminary in Emmitsburg, Maryland, graduating in 1983 with a master of divinity degree and a master’s degree in theology. He was ordained a priest for the Diocese of Pittsburgh June 25, 1983. After ordination, then-Father Burns served in parish ministry, diocesan administration, and in vocation and seminary work. He was the director of clergy personnel for the Pittsburgh Diocese when then-Bishop Donald W. Wuerl of Pittsburgh released him to serve at the U.S. Conference of Catholic Bishops in Washington. On the national level he was executive director of the USCCB’s Secretariat for Vocations and Priestly Formation from 1999 to 2008. Pope Benedict named him a monsignor in 2006. Msgr. Burns returned to Pittsburgh in August 2008 as rector of St. Paul’s Seminary and director of the diocesan preordination formation department and office for vocations. Now-Cardinal Wuerl, who is archbishop of Washington, issued a statement on Bishop Burns’ new appointment, calling it “a joy to hear” that Pope Francis “has entrusted” the Dallas Diocese to him. Pittsburgh Bishop David A. Zubik said Bishop Burns’ home diocese was elated about his new appointment. Bishop Burns’ ministry “has been marked by great joy, pastoral sensitivity and a zeal for evangelization,” he said in a statement. “Here in his home diocese, we honor him as our beloved brother. He is a gift to the church and first a gift to the Church of Pittsburgh,” Bishop Zubik added. “For me personally, he is a good friend of whom I am so proud. I know you share that pride with me. We rejoice with and for the people of Dallas. For them now, he is both a gift and a blessing.